Welcome to the Jeffco Fall Baseball Tournament! Game Day Information: As of 10/7/18 @ 12:17am, all games are on schedule. 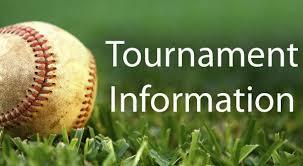 Please click here for the pitching sheet needed for the end of season single elimination tournament. Every team needs to supply their own pitching sheet. Each game, the sheet must be filled out in pen and signed by coaches from both teams. At the start of the game the umpire will validate each sheet. Updated pitching rules are as follows. Pitchers can throw a total of 6 innings (7 for 14s). One pitch equals a full inning. There is no restriction as to how many of their daily maximum innings a pitcher uses in a single game. We highly recommend coaches follow MLP Pitch Smart, which is a daily maximum. ONLY players on the official roster are allowed on the field; use of non-roster players will result in automatic disqualification of the infracting team. An official roster maybe revised prior to tournament for a specific substitute player if approved by the fall baseball director and the player is the 9th or 10th player on the roster. Substitute players must be identified at the home plate meeting to both the coach and umpire. The substitute player cannot pitch or catch and must hit at the bottom of the lineup. To request a substitute, the coach needs to email the fall baseball director the player's name, age, grade, and previous team and level of play as well as if this is the 9th or 10th player for the official tournament roster.In cases where a substitute player is approved, please print a copy of the approval and have with you at the games. Games ending in a tie will play extra innnigs using the California Tie Breaker rules. For the first tie breaker inning, last inning out will be placed at 2nd base with one out. If game is still tied at the end of the full inning, the last inning out will be placed on 3rd with one out until a winner is determined. The higher seed team at the home plate meeting will determine if they want Home or Visitor. Home team will be the official score keeper.